Some of you will know, if you've been here before, that I am a teacher. I teach English in a secondary school on the Isle of Man. 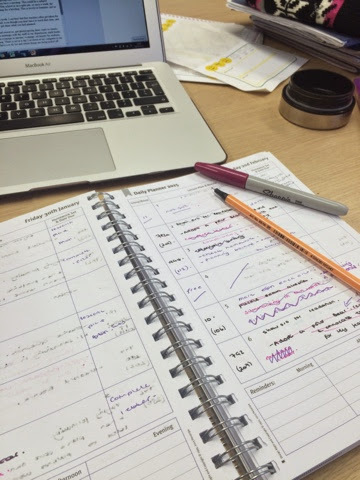 I am always interested to read other teachers' blogs and find out how similar or how different their day is to mine. So, here is what an average day for me looks like. I generally arrive at school about 8.15. This may seem late to some teachers, but I can't drop my son off with the childminder before that. School officially starts at 8.50 so I have about half an hour to check the school register and report system, which will tell me if I am cover for an absent teacher in my free lessons, check emails, photocopy what I need for the day and have a cup of tea! Two days a week we have a whole staff briefing at 8.40 too. The day begins with registration at 8.50; I have a Year 7 group, so I take the register, check everyone is ok, sort out planners, equipment, notes queries etc and then I send them on their way at 9.10. Then lessons start, we have two lessons before break, a 15 minute break and then two more lessons before lunch finally at 12.45. I throw some food down me, before sitting either in my classroom or our office and making sure I am ready for the afternoon's lessons. I also do one lunch duty a week, where I supervise the queues in the cafeteria and one lunch time club for Year 7. After lunch, we then have a 10 minute registration period with our tutor groups and then it's two more lessons before the students go home at 3.40. Once a week, the staff then have a meeting. This could be a subject meeting, a tutor meeting or a whole staff meeting. Our school is on a split site, so once a week, the staff in our building have to trek to the other building for a briefing. This is lovely in Summer, not so much in Winter when it's snowing or icy. Throughout all of this, I have five free lessons a week. I say'free' but free teachers often get taken for cover, to supervise classes of absent teachers and, even though you don't have to teach that class, just supervise it, it still means you don't necessarily get done what you had planned. When I am actually free, I may plan lessons and resources, get photocopying done, reply to emails, telephone parents, mentor students, have mini meetings with the staff in our department, mark books or assessments, put displays up, plan for open evenings or parents' evenings, set targets for students, The list goes on and is seemingly never ending. There is never a day I sit down at my computer in my frees and wonder what I could do. I always have a to do list and whilst things are being ticked off, other tasks are being added to it. I love my job. I love what I do, I love that it fits in around having children, as I can spend the holidays with my son, but it's not really a family friendly career. I'm fortunate that I have been doing this for nearly 10 years, so I don't have to do things from scratch. But it's still time consuming and it can't all be done in the school day. Inevitably, I have to get my laptop out once Charlie is in bed. I've said before on here, it really winds me up when people say why do teachers moan as they get all those holidays. And yes, there's no denying it. However, we don't get paid to be off. And each half term is so intense, I don't know if teachers could actually function without a regular break. I'm not saying other jobs aren't like that; indeed, I believe that employees don't get enough holidays anyway. So, anyway, that's my average day as a teacher - is yours different?